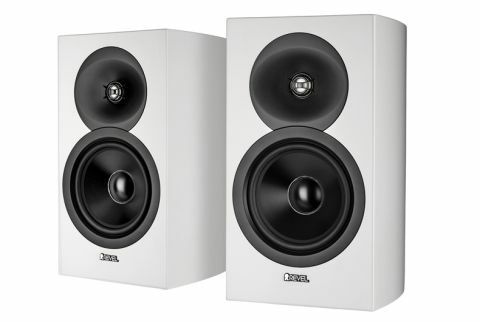 Revel Concerta2 M16 review | What Hi-Fi? A quick scan through the specifications won’t reveal anything special. It all looks pretty standard for the price. These are medium-sized wooden boxes packing a 25mm dome tweeter and a ported 16cm mid/bass driver. Both drivers use aluminium diaphragms. The speakers are single-wired, which is fine with us as it allows funds to be concentrated on a single pair of good quality speaker cables rather than split between two cheaper alternatives. Take a closer look at the details and it’s clear the company’s engineers have worked hard to optimise the performance of what initially appears to be a fairly unremarkable recipe. That wooden cabinet is a curved, strongly braced affair that not only gives a solid, relatively inert platform for the drive units to work from, but looks smart too. The unusual dished waveguide in front of the tweeter isn’t just there to make things look interesting. It controls the directivity of the tweeter, making it closer to that of the mid/bass unit at crossover frequencies. This improves integration in this all-important region. The acoustic lens – the thing that looks like a grille in front of the dome – also helps too. An aluminium cone in a mid/bass unit is fairly conventional, but in this case the cone is coated on both sides with a ceramic composite which adds both stiffness and damping – both qualities are essential for a good performance. As would be expected with a company with the technological might of Revel, both drive units have highly developed motor systems to minimise a range of distortions. Even the rear firing port is not just the straight plastic tube you’d find on most of the competition. Here it’s curved to deliver a high output without adding noise of its own. Put all these things together with Revel’s obsessive product development process and you have a pair of speakers that can stand toe-to-toe with the best sub-thousand pound standmounters around with confidence. Positioning is easy, place the speakers at least 30cm from a rear wall – and well away from corners and off you go. All that work to control the tweeter’s dispersion really seems to pay off because these speakers deliver a wide, open sound stage without fussing too much about the amount they’re angled in towards the listening position. Listen to a demanding piece of music such as Tchaikovsky’s Marché Slave Op.31 and the M16s will render an impressively expansive stereo image and populate it with precisely focused sounds. It’s all nicely layered and remains stable when the music gets busy. Perhaps even more impressive is the enthusiastic way these standmounters deliver large-scale dynamics. They pound out crescendos with relish, refusing to harden up or compress the music even at high volume levels. Then there’s the authority of the presentation, helped by the Revel’s ability to dig deeply in the bass. These speakers may just be 37cm tall, but close your eyes and you’d swear you were listening to decently sized floorstanders. Those lows are not only powerful but agile and tuneful too. Such low-end ability comes in handy with the likes of Major Lazer’s Pon De Floor. Here the bass kicks hard and true, while the speaker’s excellent attack and firm grasp of rhythmic drive ensures a full dose of excitement. Don’t go thinking these speakers lack subtlety. Such doubts will vanish once you hear how they cope with the likes of Olafur Arnalds or Dusty Springfield. That superbly integrated midrange communicates Dusty’s voice with all the finesse and passion it deserves while the speakers’ ability to organise without sounding controlling works wonders with the Broadchurch OST. You need to take care in system matching though. The M16’s clarity is admirable, but they have a ruthless edge that can easily be provoked if the partnering kit is already a touch on the aggressive side. Comparison to a class leader such as the (pricier) ATC SCM 11s shows up a shortfall of sweetness in that tweeter too. These things don’t dent our enthusiasm too much. The M16s are a bundle of fun. They may not be the most refined choice around, but they entertain in a way few price rivals can match. We think that’s worth £950 of anyone’s money.